This site gets my interest. Yes I do blog about peer-reviewed research, especially papers I am cited by or may cite. Yes that is as much a form of science communication as it is my own personal reflective thought. Done well it could add to #academic #reputation and digital footprint. Do you write about peer-reviewed research in your blog? Use ResearchBlogging.org to make it easy for your readers — and others from around the world — to find your serious posts about academic research. If you’re a blogger who writes about serious research, Research Blogging offers you a way to distinguish your serious posts from news, politics, family, bagpipes, and so on. We can direct your regular readers — and new readers — to the posts you’ve worked the hardest to create. All you need to get started is a blog and a peer-reviewed research report that you’d like to discuss. Do you like to read about new developments in science and other fields? Are you tired of “science by press release”? ResearchBlogging.org is your place. 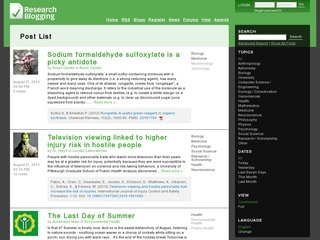 ResearchBlogging.org allows readers to easily find blog posts about serious peer-reviewed research, instead of just news reports and press releases. Bloggers — often experts in their field — find exciting new peer-reviewed research they’d like to share. They write thoughtful posts about the research for their blogs. Bloggers register with us and use a simple one-line form to create a snippet of code to place in their posts. This snippet not only notifies our site about their post, it also creates a properly formatted research citation for their blog. Our software automatically scans registered blogs for posts containing our code snippet. When it finds them, it indexes them and displays them on our front page — thousands of posts from hundreds of blogs, in one convenient place, organized by topic. Our editors identify the notable posts in each major discipline, publishing the results on our news page. Other services like PubGet index our database as well, so every time readers search for a journal article, they can also locate blog posts discussing the article.